We made contact with George on January 27, 2008. He now lives in Cohasset, MA. He promises more pictures but sent in the picture at the left of Odile's former owner Ed Colie, sailing her when she was named Sambo (Click here to go to Sambo) . He bought the black hulled Sambo from Ed sometime in the mid/late 1970's and sailed her out of Sachems Head Yacht Club in Guilford, Connecticut for about 10 years. George tells an interesting story about picking her up in Mystic, CT with his kids who were then 8-10 yrs old. While motoring down the Mystic River the plugs in the motor blew out. He got Ed to come out and they fixed things up and he headed west up Long Island Sound. On the trip he had problems again with the motor and, as it was getting dark, they decided to stay overnight at the anchorage behind Duck Island off Westbrook, CT. It was an interesting night as they were not prepared for an overnight stay. This gave them a chance to discuss the boat's name, Sambo. They decided then and there to remove the name from the transom. George's daughter was a ballerina and they picked Odile which was the name of the Black Swan in the ballet. Pretty neat name switch! George said that around 1985 he sold Odile to a guy from Portland, Maine who loaded her on a flatbed - resting the boat on her side for the trip. George never heard of her again. 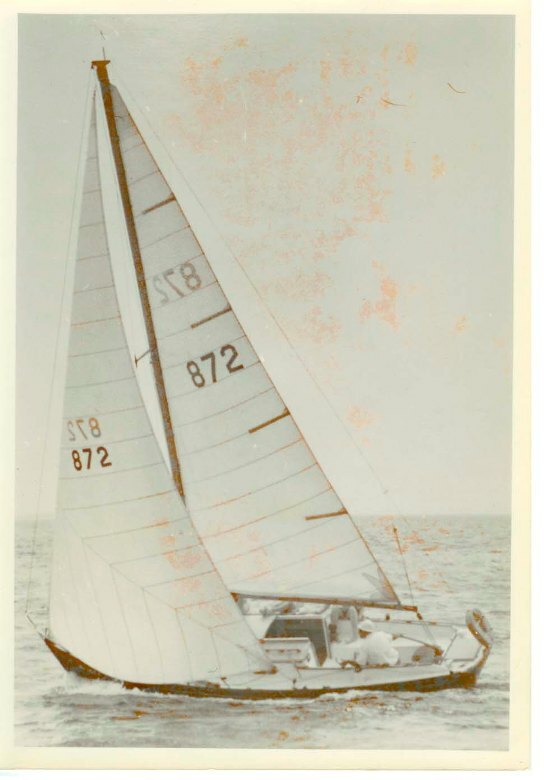 Attached is a picture of Sambo - " Ed Colie sailing Sambo in 1973". Have not found any more current pics as yet. Name changed by new owner (me) to "Odile". Moved her to Mass Bay (Hingham Bay PHRF Fleet) about 1986. Rating with a 160% jib was 243 race/255 cruising. It appears she was a Marscot, Fall River built hull - no hull # available. Sold in about 1990 to a Portland, ME buyer - can't find the records. Note: Before we bought Sambo/Odile we chartered SKUA from Loch Syme of Essex. Webmaster Note: Jim Kurt's The Rachel K was another one. George Watts and your webmaster met at his beautiful house in Cohasset and, what else, talked about Dolphins. He took me to his study and showed me this spectacular 1/12 scale half model of Odile his wife gave him years ago. It was carved by Alan McClennen, Jr., 153 Claflin St. of Belmont, MA. October 17, 2009 - This centerboard has found a new home - on Ted Prohov's Yankee # 190 Wada Boat. December 9, 2012. George provided an interesting, and identifying tidbit. Previous owner Ed Colie had trimmed about 2 inched off Sambo's spreaders so he could sheet in the jib tighter. We're still looking for this boat - and we'll check the spreader length if we find her.